Product #18048 | SKU LP34996 | 0.0 (no ratings yet) Thanks for your rating! 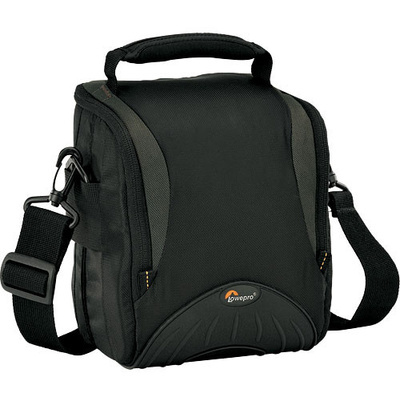 The Lowepro Apex 120 AW Shoulder Bag (Black) is a single-compartment bag with adjustable, padded dividers that accommodates a digital SLR with small zoon lens attached, plus accessories. The bag has a built-in micro-fibre cloth, that protects LCD screens and lenses. There is an All-Weather Cover that protects gear against bad weather, dust and sand. It has adjustable, padded dividers to provide excellent protection and a customised fit. The bag has a SlipLock attachment loop. The rugged exterior includes a moulded rubber bumper and durable, water-resistant fabrics. Meets current FAA requirements for carry on bags. Moulded rubber bumpers provide additional protection.